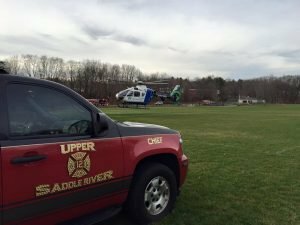 Today at 3:05pm, the USRFD was dispatched to set up a landing zone at Lions Park for a medivac transport for the ambulance corps. Chief Vierheilig, Asst Chief Rauch, Engine 1232, Rescue 1242, and Engine 1231 responded and maintained a safe zone for the landing. Once the patient was loaded on board and flight on its way, all units returned to HQ.